Check your eligibility for the federal government’s modification and refinance programs: You may qualify for assistance under the federal Home Affordable Modification Program (HAMP), the Home Affordable Refinance Program (HARP), or other similar government programs. If you cannot afford to make your monthly mortgage payments, you may qualify for a loan modification or loan refinance to make your monthly payment more affordable. To find out more about the program, visit www.MakingHomeAffordable.gov. Or http://www.aghomehelp.com. If you’re at risk of losing your home because you’ve missed payments and have exhausted all other sources of help, the New York State Mortgage Assistance Program may be an option for you. NYS-MAP provides a 0% interest mortgage loan up to $40,000 to eligible New York homeowners at risk of foreclosure. To see if you might be eligible for the New York State Mortgage Assistance Program, please fill out the following form so that we can connect you with a government-vetted non-profit housing counselor or legal services provider in your region. If you have previously filled out this form or are in the application process for the NYS-MAP program, please call the Homeowner Hub at (855) NYS-MAP3. Belmont offers free private, confidential counseling with experienced NCHEC Certified Foreclosure Counselors. Discover your foreclosure prevention options, information on current government programs, assistance in completion of loss mitigation paperwork, negotiations of modifications with lenders, and referrals to non-profit legal and other community resources. We are currently partnering with the municipalities of Hamburg, Cheektowaga, North Tonawanda, and Tonawanda to help administer the New York State Abandoned Property Neighborhood Relief Act of 2016. Contact a Housing Counselor to learn more. Western New York has been extremely hard hit by the mortgage foreclosure crisis. Many homeowners are victims of bad loans while others, after falling behind due to temporary pay cuts, were caught up in overwhelming fees and penalties. In order to ensure that homes are not lost unjustly, New York State instituted mandatory settlement conferences. Homeowners can now obtain loan modifications under judicial review through a process that requires lenders to negotiate in good faith. 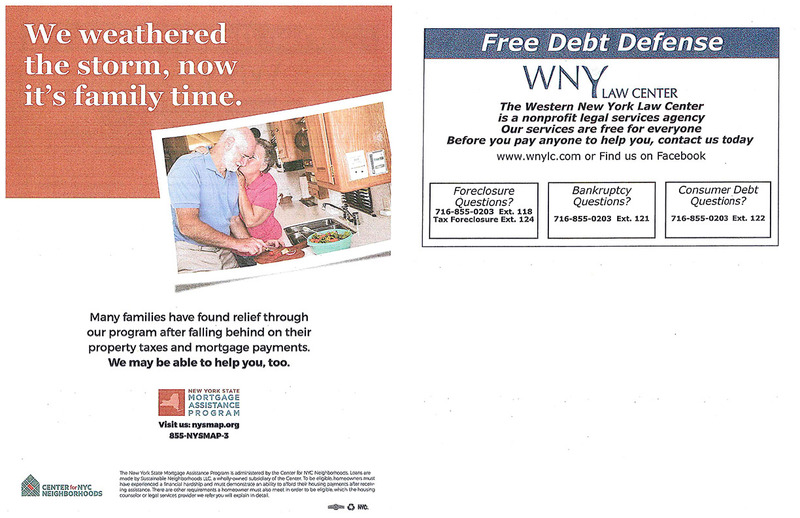 Legal Aid works in conjunction with the Western New York Law Center and the Center for Elder Law and Justice in the Foreclosure Prevention Project of Western New York to cover residential foreclosure defense throughout the region. Financial hardship packages are prepared with the assistance of certified housing counseling agencies. This group defends mortgage foreclosures throughout Western New York. As part of the project, the Legal Aid Bureau primarily covers cases in Erie and Niagara Counties. Please contact their office if you need assistance at 716-853-9555. The SONYMA Community Restoration Fund (CRF) is part of New York State Office of Homes and Community Renewal’s response to the foreclosure crisis: a groundbreaking program that acquires pools of defaulted mortgages and provides homeowners with an opportunity to start fresh with a more affordable payment. This program focuses on keeping families in their homes and ensuring that abandoned homes are quickly sold to owner occupant buyers whenever possible. The CRF reinforces numerous other state and local efforts aimed at reducing foreclosure rates and stabilizing neighborhoods. In this way, the fund helps areas avoid blight and its associated strains on municipal budgets while keeping neighborhoods active and growing. Key to the program’s success is SONYMA’s partnership with local nonprofit foreclosure prevention experts across the state to help families through the restructure process and assist with essential repairs. How the CRF Works: To keep the original owners affordably in their homes, the CRF program works in ways that public and private servicers cannot, including engaging a network of locally based nonprofit housing counseling organizations that provide one-on-one counseling with the owner, and possibly facilitating completion of necessary health and safety repairs. In cases where a mortgage modification is not possible and the homeowner cannot financially support a reduced mortgage or no longer wants to own their home, the CRF, through its nonprofit partners, can offer resources and support to help the owner get a fresh start, while ensuring that the property is not abandoned, is quickly repaired and resold as affordable housing to a qualified buyer. 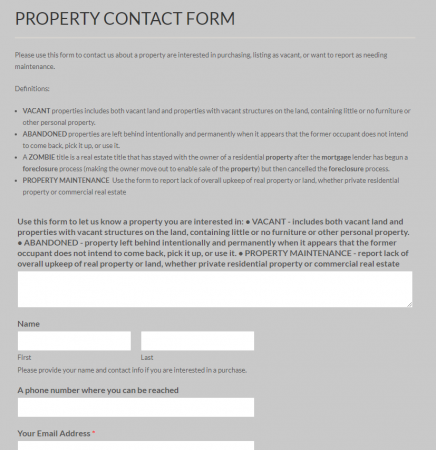 The program is designed to be flexible and self-sustaining by reinvesting resources recovered when the new mortgages are repaid, or when properties are sold. Affordable Housing Programs: Research shows that services such as child care, education assistance, financial counseling, transportation, and employment all help families maintain stable housing situations. To that end, all of the services provided by Community Action Organization are designed to help families address the affordable housing crisis in the areas we serve. - Counseling and case management to identify symptoms that lead to crises – aimed at establishing self-sufficiency.